Domestic armed conflicts have emerged as the most common, most virulent, and least tractable form of contemporary conflict. Additionally, these conflicts tend to motivate third parties to get involved since such conflicts affect their own strategic, economic, and/or humanitarian interests. 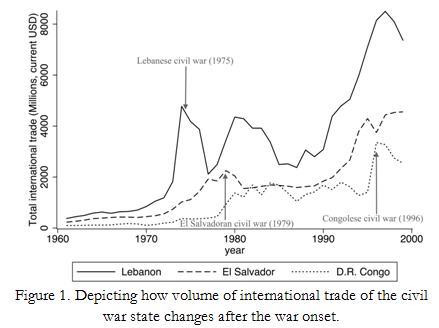 As an example, Figure 1 depicts the decline in trade levels following the onset of civil wars in the Democratic Republic of the Congo, El Salvador, and Lebanon. Given the extent of international economic linkages and the adverse effects that civil wars can have on these interests, one has to consider the role of economic relationships in influencing the involvement of third parties in civil wars. Adding to their intractability, these conflicts are quite commonly subject to outside influence, where competing third-party interests support various warring parties. For example, the civil conflicts in the Democratic Republic of the Congo led to the involvement of several African states supporting opposing sides in this conflict. 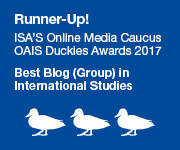 Although previous research has identified how transnational political, social, and economic linkages influence civil war dynamics, few have examined how these ties steer intervention to support a particular side in a conflict. In a study recently published in the Journal of Peace Research, we argue that strong bilateral economic interests actually increase the likelihood of military and economic interventions in civil wars of important economic partner-states. Figure 2 illustrates our findings. 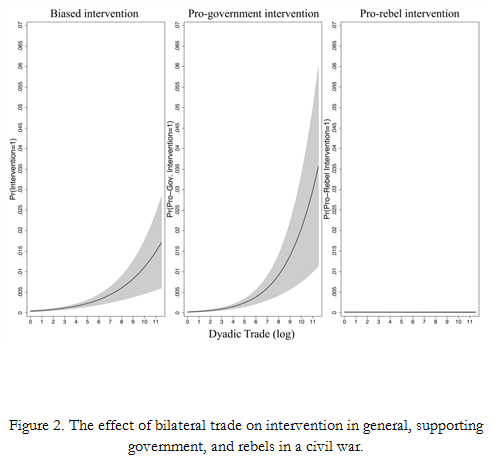 First, high levels of bilateral trade between the civil war state and the potential intervener increase the likelihood of intervention (see leftmost chart in Figure 2). Second, such economic-interest stimulated intervention is more likely to support the government side and not the opposition (see center and rightmost charts in Figure 2). In other words, strong economic ties have a similar effect to military alliances in that they heighten the importance of the political situation of partner state and the stability of its government. There are good reasons to expect that economic ties may motivate third party interventions. First, domestic economic actors that benefit from economic exchange with civil war states are likely to seek to mitigate conflicts that threaten their interests. 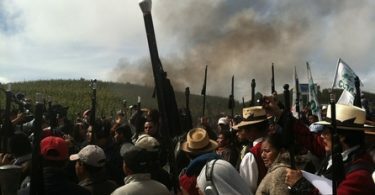 In the event of the outbreak of a civil war, these actors can pressure their respective governments to find a solution to the civil war in their economic partner state, including through economic and military intervention. Second, the GATT/WTO period ushered in a dramatic increase in international trade, accompanied by an unprecedented number of inter-governmental trade agreements. The process of negotiating these trade pacts has entailed constant government-to-government contacts that enhance diplomatic relations and make a third-party intervention in support of the embattled government, rather than rebels, more likely. Our argument and findings offer interesting explanations for recent third party involvement in civil conflicts in Ukraine and Syria. For Syria, China and Russia’s support for Assad’s government is the result of their deep economic and in the latter case also strategic ties with Syria. Our argument leads us to hypothesize that such ties may be threatened by a regime change that the various rebel factions want, thus influencing Chinese and Russian support of the Syrian government. In the case of Ukraine, we can postulate that Russia’s support of eastern Ukrainian rebels is a continuation of the support for former pro-Russian governments, which fostered strong economic and strategic ties between Russia and Ukraine. These ties have become threatened by Ukraine’s new pro-Western government, which took power as a result of overthrowing Victor Yanukovych’s pro-Russian regime, and affirming its intention to form closer economic linkages with the European Union. The logic of our argument can also shed light on European hesitation to intervene or apply heavy sanctions on Russia as a consequence of economic interdependence between Russia, which supports the rebels, and the European Union, that supports the Poroshenko’s government. As recent Foreign Policy magazine illustrated the sheer size of Russia-Europe interdependence dwarfs EU-Ukraine ties, and makes it hard for Europeans to punish Russian aggression. Beyond explaining contemporary interventions, our findings have important implications for peace management of domestic armed disputes. Economic ties can help identify a set of actors interested in the resolution of a domestic political conflict. These actors, with a vested interest in the political stability of the afflicted state, can support various conflict management strategies and are likely to participate in financial and military burden sharing that accompany mediation and conflict resolution. It is after all in their interest. In short, while economic interests may interalia increase the chances of military intervention, their primary objective is not to use force, but rather to promote peace that in turn facilitates commerce. The resolution of the post-election impasse in Kenya in 2008 illustrates the effect of economic ties in mitigating a domestic dispute from erupting into a full-scale civil war. Kenya’s key economic partners including the East African Community, the European Union, and the United States were influential in mediation efforts between the incumbent and the challenger that helped to deescalate the dispute and begin the process of instituting constitutional reforms to avert future crises. 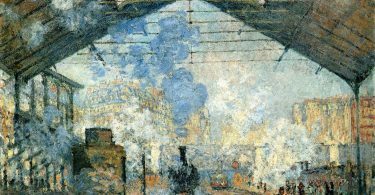 Additionally, conflict management strategies prior to militarization of domestic disputes can be significantly enhanced if they integrate the sets of actors that have strong economic ties to the civil war state with existing conflict early warning systems. Economic partners are likely to pay close attention to threatening signs and act to resolve domestic disputes that are likely to escalate to armed conflict and thus affect their commercial interests. Peacemaking efforts can therefore look towards commercial ties to identify a set of motivated actors interested in conflict resolution and more willing to allocate resources to that end. Put differently, economic interests may be employed as a force for peace, working towards the resolution of domestic armed conflicts, even if rational self-interest lies at the core of their motivations. Szymon Stojek is a Visiting Assistant Professor at Bridgewater College in Virginia. Mwita Chacha is an Assistant Professor at Nazarbayev University in Astana, Kazakhstan. Ukraine’s new pro-Western government went further than that. They also stated their intention to reduce economic ties with Russia, reasoning that these ties led to their economic dependence, and reasoning that they would be better off to err on the side of destroying the economic ties completely, vs submitting to an economically dependent position. Ukraine’s 2014 government then acted on this intention by instructing Naftogaz to halt payments to Gazprom, after Gazprom, as expected, did not extend the same discount its hostile clients as it offered to its clients when they were friendly. The not-so-distant history of the gas pricing is relevant too. The baseline price, at the time of the Maidan change in government, was a 10-year contract signed in 2009, when anti-Russian government of Yushchenko was in power. Ironically, and probably quite unjustly, Yuschenko’s successor and Yanukovich’s predecessor, Tymoshenko, who negotiated the contract with Gazprom, was then put in jail by Yanukovich for negotiating this contract. While in jail she was much abused (got out of jail unable to walk!) and radicalized, which probably led among other things to Yanukovich’s overthrow. However her personal story isn’t nearly enough to account for what happened. The other oligarchs were also needed, and they have economic ties of their own. The Ukraine conflict was in part a story of a turf war between oligarchs, since Yanukovich was one himself. Also needed were promises of protection by other foreign powers, hoping for economic ties of their own, in addition to considerations of national power. So “economic ties” did most certainly play a part in Ukraine’s “civil conflict”.